We no longer recommend Paddy Power due to persistent issues with their app. Paddy Power is currently the best app. William Hill are one of the the United Kingdom's oldest & largest bookies. 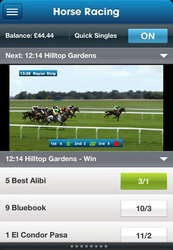 William Hill offer a range of betting offers to exclusively to their mobile users. 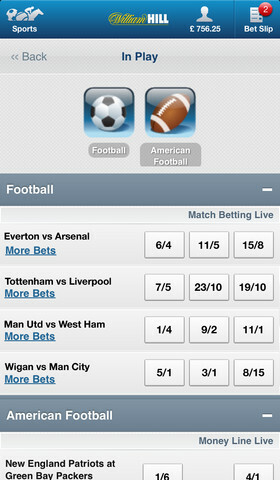 Mobile access to the largest selection of in-play betting markets available. William Hill, one of London’s original High Street bookmakers, and a global leader in all forms of gambling both live and online offers one of the best mobile applications for online wagering. 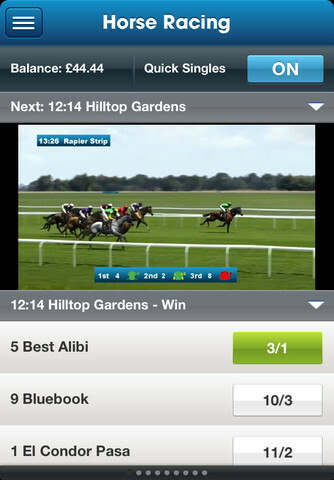 William Hill’s mobile application is offered via the iTunes and Android stores, but is also available via browser with no download required. The application is available on any mobile device that has an internet connection, including iPhones, Androids, Blackberries and many other platforms. William Hill is based in the United Kingdom and is headquartered in Wood Green, a suburb of London and Harehills in Leeds, West Yorkshire. Will Hill is licensed and regulated by the UK Gambling Commission, one of the stricter gambling regulators in the world. In addition to sports betting, William Hill offers poker, casino, skill games, bingo, financials and horse racing. Many of these options are also available via the mobile application. Over their long illustrious history as bookmakers, William Hill has always seemed to adapt to the marketplace, which is one of the reasons they have been so successful. In fact, they are often leading the way in all things gaming. That’s why it is not surprising that their mobile application is one of the best around. The app offers a nearly unlimited amount of betting markets for players and has all the wagers available to bettors who use the main site. This includes Free Bet Offers, which is something that William Hill has become famous for. In-play betting or live betting is also available for wagering via the mobile application. The betting application is extremely easy to use. Betting menus slide quickly across the screen making it easy to peruse through different betting markets and options. Once players find their desired market, they move onto the betting slip. The betting slip page operates identically to betting on William’s Hill’s desktop site. Players can easily add and remove bets from their slip and change the bet type along with the amount. This is exactly how a mobile application should operate. Not as an entirely different program to learn but as an extension of the desktop wagering interface. Players will be able to view all of their account details, deposit and queue up withdrawals. This is all easily done from inside the app. Bettors will be able to use the full assortment of deposit and withdrawal options from the mobile app, as well. Still, players may have a difficult time understanding mobile betting. Luckily, William Hill has a dedicated support team to handle issues players may have with their mobile betting app. Players can call William Hill directly from inside the app. From all the mobile apps we’ve reviewed, they are the only online bookmaker with a dedicated support line specific to mobile wagering. 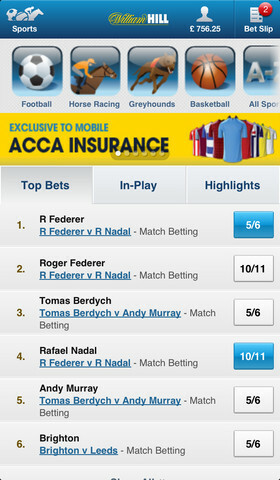 For the most part, the application feels like William Hill’s desktop betting interface. It's professional looking, fast and most importantly bug free. Bright with a mix of blue and white color, the app is polished and visually appealing. 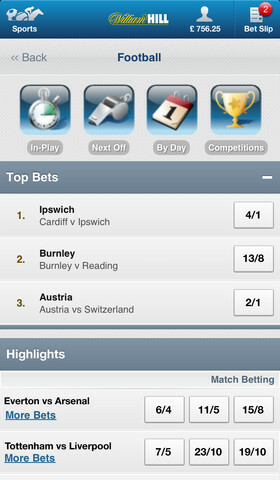 William Hill has hit a home run with their betting app. It genuinely provides the bettor with excitement as he logs in and views the hundreds of betting markets and options, all which can be browsed from anywhere in the world. Bettors truly feel like they have the entire betting world in the palm of their hand. William Hill does not offer large deposit bonuses like other bookmakers, but they do offer a 100% Match Bonus up to £25 for a players’ first deposit. However, their small bonus is not a reason to stay away. They offer tons of free bet promotions daily, along with many seasonal promotions and bonuses. Many of these offer superb value to bettors and more than make up for the small deposit bonus. Many players check their free bet offers daily, so they do not miss out on any extra chances to add money to their bankroll – and remember, all of these betting opportunities are accessible via the mobile app. William Hill offers an expansive selection of betting options and a wide array of betting markets. All major sports are covered with the most popular being Football, Cricket, Rugby and Basketball. American sports also have a large following with nightly props and spread betting available for American Football, Basketball, Baseball and Hockey. Of course, this is just the tip of the iceberg at William Hill. They offer betting markets on nearly every sport imaginable. We are not shocked by William Hill’s success in the mobile betting market as they have been succeeding for 70 years in the gaming industry. Their mobile betting interface is the best one we’ve come across, and we would recommend it over any other product out there on the market today.